I was super excited when I was called by Chef’s Garden Catering to be a part of a baby shower tea party! And, when I was told there would be shades of pink involved oh my yes! I knew I wanted to keep it pretty in pink by using different hues of the color without going over the top pink. I went straight to the Fostoria pink water goblets as they are one of my favorites! I mixed those with blush goblets and a pink tumbler. The Cristal champagne flutes balanced out the pinks nicely. For the tea cups, I chose florals in different shades of primarily pinks and golds with a few other colors mixed in. 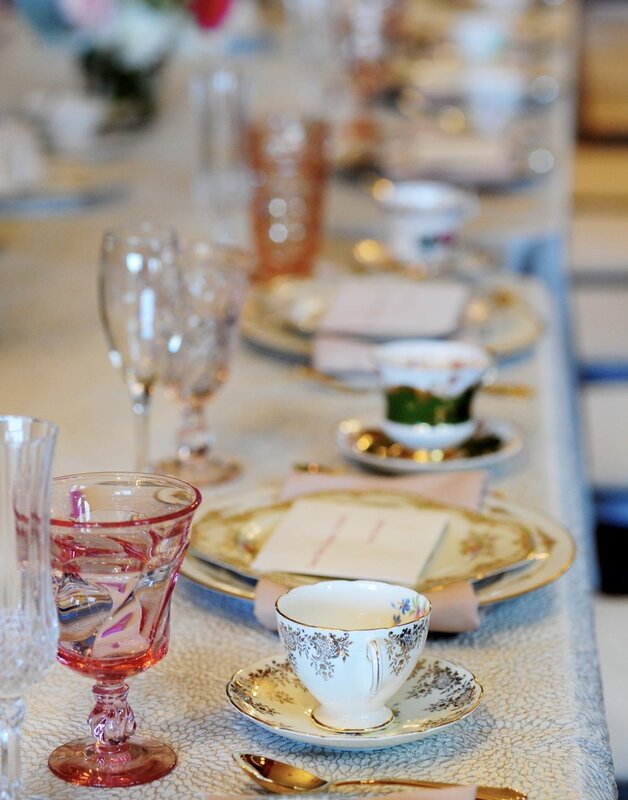 Several Royal Albert tea cups other bone china tea cups set the table. These tea cups would make me want to put my pinky up and give a high five for tea time! White dinner plates trimmed in gold and silver were used as the chargers. Using dinner plates for chargers is a great idea if you are using luncheon plates to eat off of. The luncheon plates used had shades of pink, lavender, and gold. So dainty and pretty!